From the time I was about ten years old, I did a lot of babysitting. The majority of my weekends from middle school through high school were spent babysitting. Many summers I opted to babysit instead of look for a "real" job (but don't let anyone tell you babysitting isn't work!). I may have given up a New Year's Eve or two in favor of making an extra sum that evening. Even in college, hundreds of miles away from home, I still managed to get my fix, working in a daycare and watching a newborn a few hours a week. Today, at twenty-six, I'm still babysitting...only now it's my friends' kids instead of my parent's friends' kids! There's no doubt that I've spent my fair share of time with children, and while I can recollect a number of challenging moments, the biggest ones typically revolved around mealtime and bedtime. While the secret to a perfect bedtime routine might still be a mystery to me, I knew how to get kids to eat: give them something to dip! Give them ketchup, BBQ sauce, ranch dressing, maple syrup, anything to dip their waffle, grilled cheese, or chicken nuggets into and they were suddenly shoving food into their mouths. Never mind that it was sometimes syrup with grilled cheese or ketchup with waffles (true story)! I think those kids were onto something, because I have to agree that dipping your food makes it that much more exciting. When I was given the opportunity to create a recipe to promote Hidden Valley Ranch and the Chef & Child Foundation's Lunch Break for Kids fundraiser taking place this week, I knew it needed to be kid-friendly. I put a call out to my Facebook fans asking for some ranch inspiration. They answered the call, sharing their favorite ways to use ranch...everything from soups to pizza to slow cooker chicken. 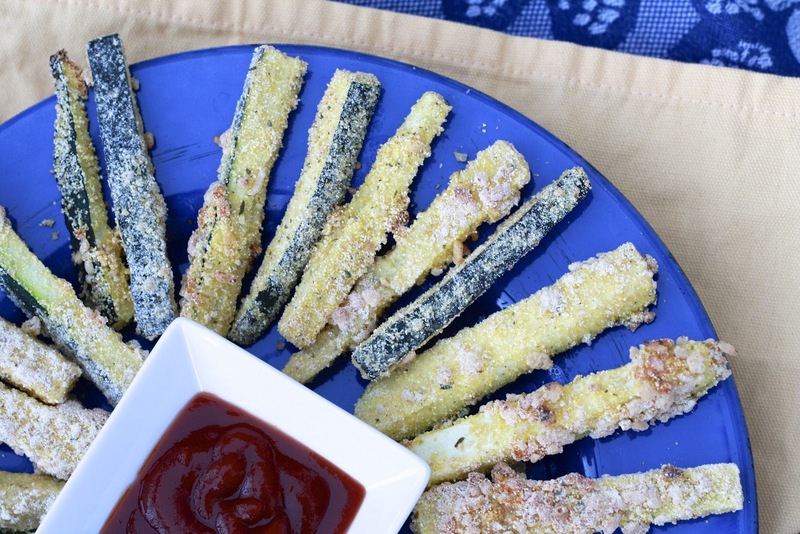 One answer stood out to me--using the dried seasoning mix to make fried zucchini. How do you make vegetables kid friendly? 1. You make it taste like ranch dressing. 2. You give them something to dip it in. 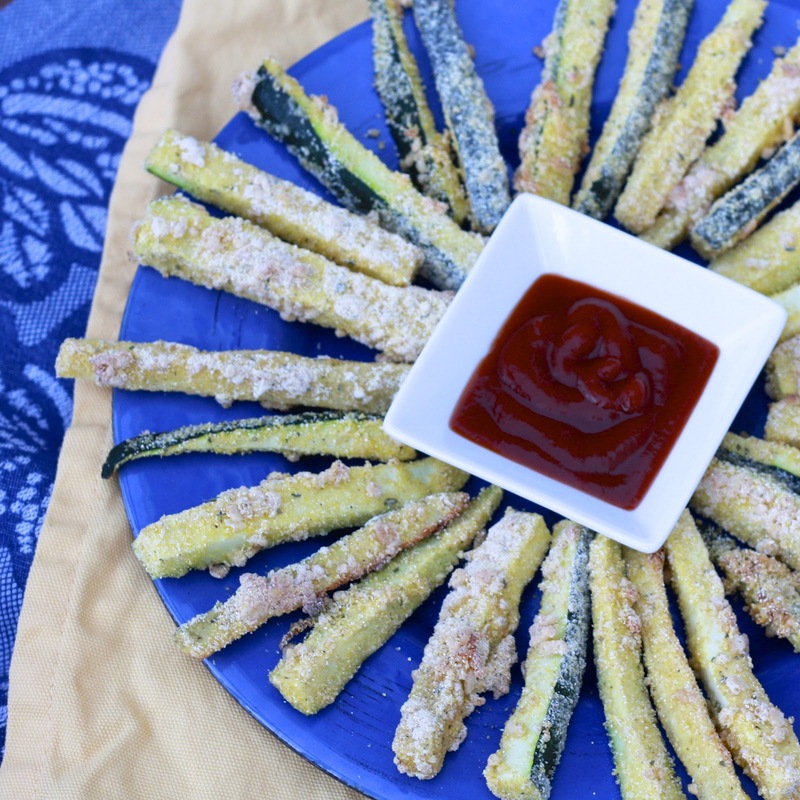 Because the zucchini is baked and not fried, it's healthy enough for an after school snack or a dinner side. I used a mixture of dried ranch seasoning, cornmeal, and crushed rice krispies (the cereal part inspired by Gina!) to coat the zucchini sticks. As it turns out, they're adult friendly too! I served the zucchini sticks with ketchup, the ultimate kid food, and finished off the entire plate. 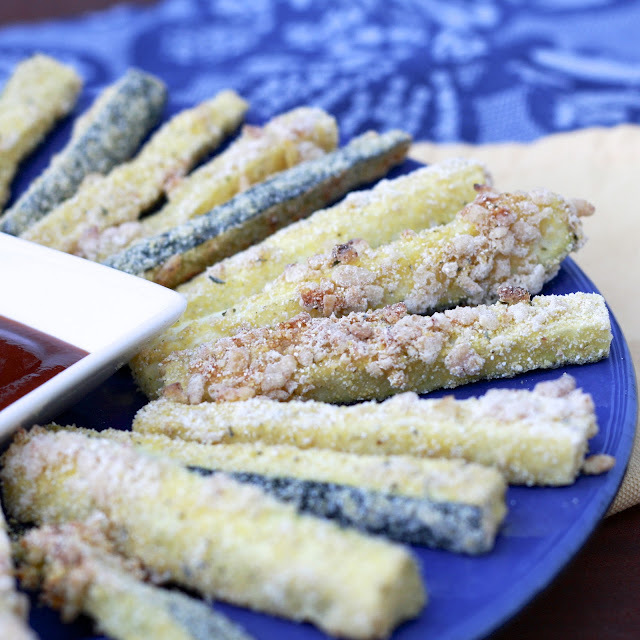 Marinara might be the more refined option, but the crispy zucchini sticks dipped in ketchup made them feel more like french fries...and dipping the in ketchup was certainly better than maple syrup! 1. Preheat oven to 425F and line a baking sheet with foil. Crack eggs into a small dish and beat with a fork. Dump cereal, cornmeal, and ranch seasoning into a gallon-sized Ziploc bag. Using your hands, gently crush cereal. 2. Cut zucchini into "fry-like" shapes (cut zucchini in half horizontally and then slice into thin strips). Dip pieces of zucchini into egg mixture and turn to coat before dipping into the bag of dry ingredients. Shake bag to coat zucchini before carefully placing on prepared baking sheet. 3. 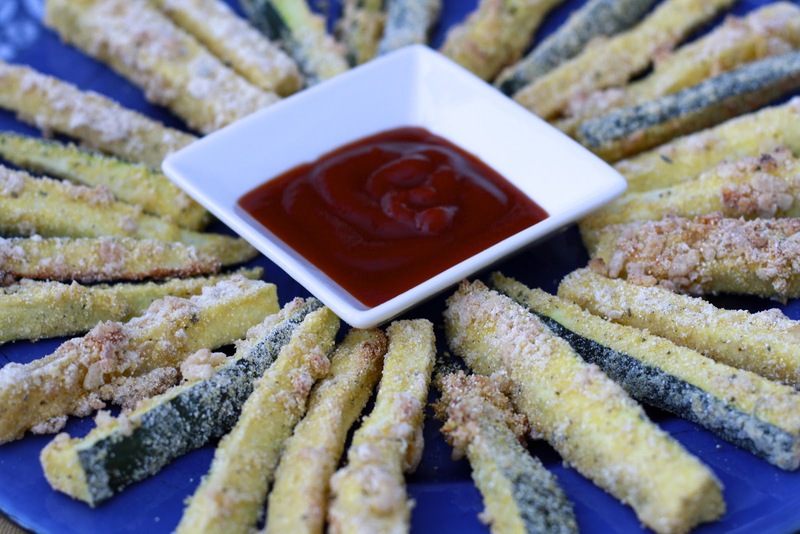 Bake for 20-25 minutes, until zucchini are lightly browned and crisp. Serve immediately with ketchup or marinara sauce.